Creme Fraiche Recipe - What is Creme Fraiche? This creme fraiche recipe could come in handy if you plan on doing a lot of French cooking. Crème fraîche is a common ingredient in French recipes, both sweet and savory, but you may have trouble finding it in your local grocery store. Or if you do find it, you may be having an issue with the price. If you leave cream sitting around for a bit, the naturally present bacteria will eventually sour and thicken it. This is the original crème fraîche. It is somewhat similar to sour cream, but thicker and more velvety in texture, nutty and less sour in taste. It also holds up better to cooking, resisting curdling and making it an ideal ingredient to stir into sauces, soups and all sorts of recipes. The French take their crème fraîche seriously and you can even find it with an AOC (appellation d'origine contrôlée). If the label reads Crème Fraîche d'Isigny that indicates that it was produced in a precisely defined geographical area in Normandy, a land of green pastures and fat, happy cows. You can use crème fraiche in any recipe where whipping cream or sour cream is called for. It will give the same richness, but also a little something extra for flavor. Unlike sour cream, it can be heated and will not separate. However, it is always a good idea not to overdo it, and adding it at the end of the recipe works best for stove top cooking. You can whip it, and it will incoporate some air and becoming fluffier. However, it will not puff up as much as whipped cream. For a great poached salmon topper, try it in this dill sauce recipe. Use it in just about any quiche recipe, including the classic quiche Lorraine. Crème fraîche is classically paired with caviar and salmon in making canape recipes. Use it wherever you like sour cream: in dips or on baked potatoes. Stir it into any dish cooked in a sauce (such as chicken fricassee or mustard pork chops) or soups. Although it does resist curdling, I would recommend an easy touch with the heat. Don't go boiling the heck out of your crème fraîche. Use a dollop to top steamed vegetables or baked fish for a quick and effective flavor enhancer. Use it for part of the cream in making ice cream. It would go particularly well with fruit flavors and sweetened with honey. 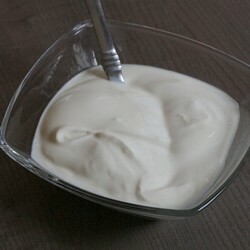 Whip crème fraîche with a little sugar or honey and use it top any of your favorite desserts. Remember that this will be a little tart tasting compared with regular whipping cream. Crème fraîche invites experimentation. Have fun. OK, I'm not going to lie to you and tell you that this creme fraiche recipe tastes and acts just like the real thing, but it does make a fair substitute especially if you are planning on using it as an ingredient in other recipes. Just so you know what you're aiming at you might like to buy the real thing one time. Of course you might get hooked and have to move to France so you can eat it all the time! In a small saucepan, heat the cream until it is just warm to the touch (about 100° F or 40°C). Remove from the heat and stir in the buttermilk. Pour the mixture into a clean jar and place the lid on top without screwing it down. Place the jar in a warm corner of the kitchen and let stand for 24 hours, stirring a couple of times during this time. At the end of 24 hours the cream should be somewhat thickened. Place in the refrigerator with the lid screwed down and let sit another 24 hours, after which time it should be fairly thick. You can whip the cream to thicken this creme fraiche recipe even further. That's it. Your creme fraiche will last about 10 days in the refrigerator. Return to Gourmet Cooking Supplies.